In a food processor combine chickpeas, harissa, fresh herbs, cumin, sea salt, pepper, lemon zest and three slices of bread. Blitz until mixture is fine crumbs. Form mixture into 12 falafels - round balls, roughly gold ball size. *If desired, tuck a little piece of feta into the center of each falafel before frying (highly recommended). Heat oil in a large pan over medium heat. 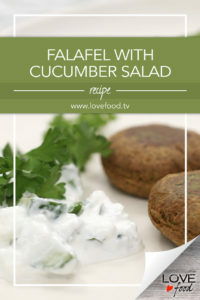 Fry falafels for 2-3 minutes per side, rolling them around, working in batches. Drain on a plate lined with paper towel. Slice the cucumbers into bite-sized pieces place in a bowl. Grind sea salt with garlic, using the flat side of the knife. Scrape into a bowl with the cucumber. Add remaining ingredients and stir to combine. Salad is best made just before serving.